The much anticipated opium de-addiction centre at the bank of Tissing river was inaugurated by Parliamentary Secretary, Power, Thangwang Wangham in the presence of Kanubari MLA Gabriel D Wangsu ,Longding DC Vikram Singh Malik IAS and Longding SP Rohit Meena IPS on Saturday. The DC Mallik was all praise for PS Wangham who in spite of all the hurdles came up with the unique rehabilitation centre for the opium addicts. He also urged all the the local leaders to contribute in their own means to realise the dream of opium free longding. Kanubari MLA Gabriel D Wangsu contributed 10 Lakhs towards the realisation of opium rehabilitation centre and also urged the people not to politicise the matter as the opium rehabilitation centre would benefit the whole district. MLA Wangsu appreciated the CM Pema Khandu and deputy CM Chowna Mein for funding the establishment of the centre. PS Wangham cautioned the dealers of opium that they would be dealt with iron hand as he opined that they’re the main culprits behind the opium menace. He also donated 20 Lakhs towards the development of opium rehabilitation centre. In response to the criticism by some section of the people regarding the livelihood of the opium cultivators , Wangham retorted that cardamom plantation and tea plantation were some of the alternate arrangements made by the government to stop the cultivation of opium. 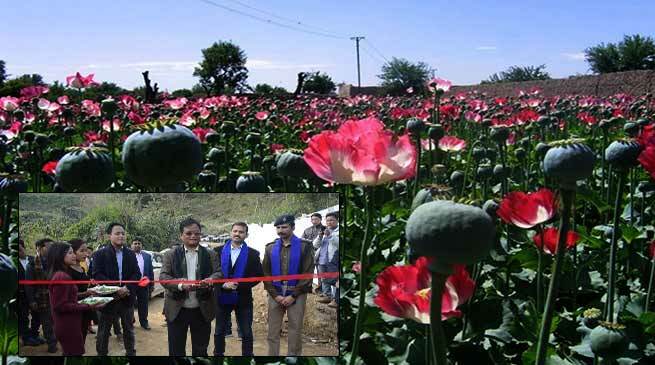 It may be noted here that Longding is the district most infested with opium addiction and the establishment of opium deaddiction centre ,the brainchild of PS Wangham is a much welcomed step. As many as 36 opium addicts from Pumao village has been admitted in the firsts phase. Gauhati HC Directs Personal Appearance of the Commissioner, Secretary of Finance Dpt.